Babblings of a Mommy: Barnes & Noble Online Storytime. Barnes & Noble Online Storytime. I had no idea Barnes and Nobles had an online story time! When Arianna was a toddler I would take her to their story time and craft day every week. She loved listening to the books and doing the fun activities and mama loved the in-store Starbucks (woot woot). I haven't taken her in awhile but she still loves books just as much. The Barnes and Nobles online storytime has popular children's stories read by authors and celebrities. This month they have one of my daughters FAVORITE books: Pinkalicious, read by the author Victoria Kann! In addition they have 45% off her whole Pinkalicious collection. Next month they'll be featuring Green Eggs and Ham for your little youngin's, and I'm sure they'll have a Dr. Seuss sale for you to stock up-- so don't miss out! 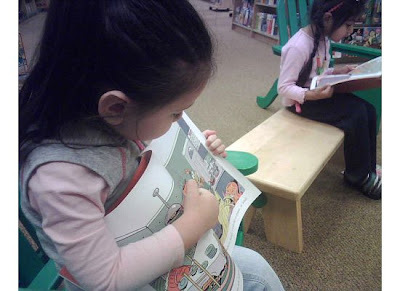 Do you like to take your kids to Storytime?